Wanted to pass along a couple of quick takeaways from a post I ran across on the Rural Tourism Marketing blog. The author relates how they were out exploring an area they were unfamiliar with and turned to their mobile device to locate a nearby place to eat (Mexican in particular.) Ultimately, they were able to find a place that had an informative website, some great reviews on Google Places, and gave them a 10% discount when they checked in on Facebook. 1. Using a few of the available internet marketing tools can get you the attention necessary to attract your customers. In El Kiosco’s case, the owner has claimed his Google Places page (important to keep Google happy), created a very simple website and maintained a Facebook business page. That’s it. In short, only pick the tools that work the best for you and your business. They don’t have to be the latest and greatest technologies to be effective. Most of the time, they just have to deliver information that is simple, straightforward, and useful to customers who are basing their decisions on a few key questions; Is this what I’m looking for? Is it close by? What are other folks saying about this place? If you can provide them these few snippets of information in a concise fashion, you increase your chances of reeling them in exponentially. 2. Internet marketing doesn’t have to rule your life to be successful. This business owner, like you, spends most of his waking hours at his business. By encouraging us customers to check in and leave comments and reviews, he is effectively using internet tools to allow us, his customers, to help him do his marketing for him. If you’re pressed for time in your marketing efforts (and really, who isn’t these days?) this is an essential element. You have to make sure that your customers are doing some of the legwork for you. But you have to help them along the way. Any little thing you can do to spark the conversation will help. Put up little signs reminding them they can check in or give them incentives to take action online. Those small sparks are really an investment in word-of-mouth marketing. That 10% “check-in” discount you give a current customer can turn into thousands of dollars of new business over time if it generates a positive experience and a glowing customer review. 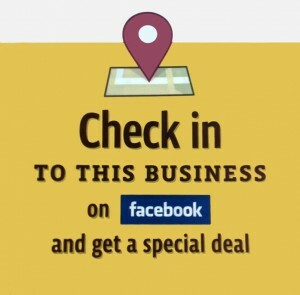 Update: Here’s a nice link on the transisition of Facebook Check-In Deals (mentioned above) to their Offers product. Also some nice tips on how to activate offers and best practices in implementing them. This entry was posted in Low Budget, Mobile, Social Media and tagged Check-Ins, mobile, reviews, word of mouth. Bookmark the permalink.